Greetings, fright fans! Cap'n Howdy coming to you from the 14th annual Nevermore Film Festival in Durham, where I just spent the last six hours up to my neck in a horror triple feature. As it is the duty of someone who calls himself "Cap'n Howdy" to attend a horror film festival, it seems only fair to report back to you with my findings. The Cap'n kicked off this year's Nevermore with a film I hadn't seen or heard anything about, The Last Will and Testament of Rosalind Leigh, a cross between "haunted house" and "religious fundamentalism" spook show heavy on atmosphere and tension starring Vanessa Redgrave and Breaking Bad's Aaron Paul look-alike Aaron Poole*. To my pleasant surprise, despite first time director Rodrigo Gudiño's inclusion of creepy angel statues (don't blink! 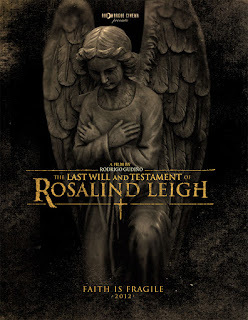 ), mannequins, broken dolls, and a particularly nasty "monster," The Last Will and Testament of Rosalind Leigh avoids "jump" scares for most of the film. Instead, much of the film is built around set-ups and pay-offs, some obvious, some not so, but all designed around the separation between the late mother Rosalind (Redgrave, mostly through narration) and Leon Leigh (Poole), who had a falling out as a result of his father's death. While his parents belonged to a religious group that insisted in eternal souls, angels, and a vengeful God who punished non-believers, Leon turned away when the cult drove his father to suicide. That, and the "game of candles" that his mother forced him to play, assuring him that if she blew out all of the candles before he "believed" that the angel would turn his back on him and the "darkness" would consume him. The lasting psychological damage continues to wear at Leon, and when he discovers his estranged mother bought his entire collection of antiques anonymously, he finds himself alone in a house confronted by his past, by members of the religious movement, and something lurking outside. Oh, and the angel in Rosalind's "worship" room. The one on a video that does something... unusual. While I found myself engaged with the story and drawn in to Gudiño's wandering camera and the rather spooky house, and while Pool and Redgrave are more than able to sell the scares as they increase, I can't help but feel like The Last Will and Testament of Rosalind Leigh stumbles a bit at the end. For one thing, there are simply too many lingering plot threads or concepts introduced in the film that don't feel developed or at times even addressed. While the reliance on Redgrave to narrate what isn't clear in the story is understandable, it comes at inopportune times in the film (especially at the end) and breaks up the narrative flow. Despite the story arc of Leon, the ending seems to make the case that this is actually Rosalind's story, which muddles the denouement a bit. 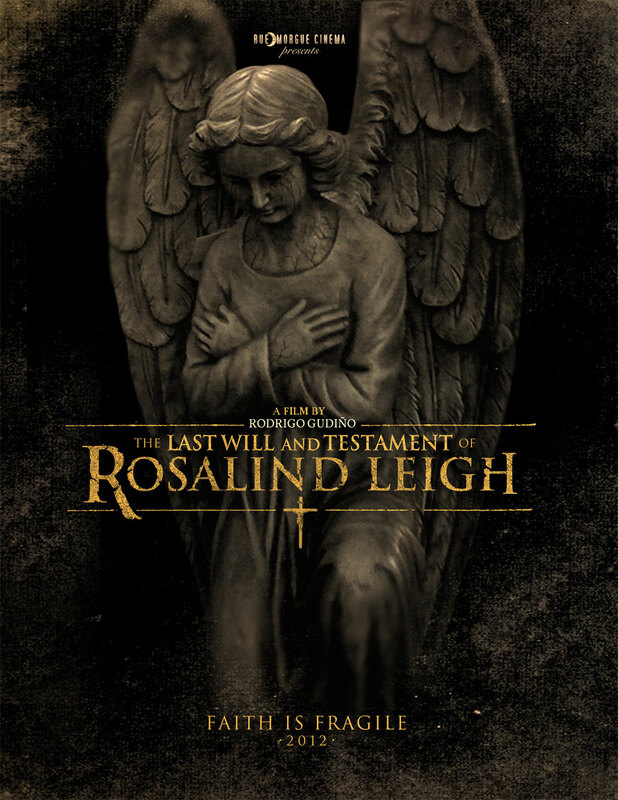 It's not enough of a stumble to keep me from recommending the film, but I feel the need to give you the head's up that while The Last Will and Testament of Rosalind Leigh builds up a good head of steam, it doesn't quite cross the finish line. Still, in a world of "jump" scares, I'll take a little atmosphere in my ghost story when I can get it. The Plan - I regret that I can't tell you much about this one, other than it involved head-swapping, brain removal, and some existential musings. The digital presentation began to skip and we missed out on most of the short. Ocho (8) - this Spanish short, with no dialogue, tells the story of witchcraft (or voodoo), rituals, birthdays, patricide, and quasi-zombies in the vein of Creepshow or Tales from the Crypt. The cast conveys quite a lot without every saying anything, and it's a suitably dark tale with an ending that made me chuckle. Refuge 115 - a very short film about a group of people hiding during the bombings in 1938 Barcelona, only to discover that this particular tunnel hides something in the darkness, something very keen on taking them one by one. She's Having a Baby - a tense, sometimes disturbing short about the lengths to which one woman will go to a child of her own - even if the other party has objections. A Joke of Too Much - an Italian take on "grindhouse" films, complete with a fake trailer at the beginning for "Invasion of the Space Worms." It has some good laughs, some inventive gore, and was fitfully entertaining. We Will Call Him Bobby - it's easy to see why this was awarded the Jury Prize at Nevermore for "Best Short Film," because the tale of a father, his son, and the beast they accidentally hit after fishing is frequently hilarious. The subtitles may give away some of the best lines in advance of the actors saying them, but it mixes comedy and horror with great aplomb. I closed out the night with The ABCs of Death, an anthology of 26 short films by different directors. Each was given a letter and had free reign to do as they pleased, and it's a mixed bag. Like most anthologies, there are some really good entries ("T," "E", "Q", "N", "W") some pretty good ones ( "A", "Y", "B", "M", "S", "C"), some that are just there ("O", "G", "I"), and quite a few you can't unsee, like "F", "P", "H", "X", "R", "L", "Z" and "F", which I will go ahead and identify as "Fart." The rest of them I'm being a bit coy with because part of watching The ABCs of Death is guessing what the letter stands for or being surprised that it wasn't what you expected it to be. Rather than give you too much more information about the shorts themselves, I'll let you know they come from Ti West (The House of the Devil), Angela Bettis (Roman), Srdjan Spasojevic (A Serbian Film), Jason Eisener (Hobo with a Shotgun), Hélène Cattet (Amer), Yoshihiro Nishimura (Tokyo Gore Police), Xavier Gens (Frontiers), Jon Schnepp (Metalocalypse), Marcel Sarmiento (Deadgirl), Adam Wingard (A Horrible Way to Die), Ben Wheatley (Kill List), Kaare Andrews (Altitude), Nacho Vigalondo (Timecrimes), and Noboru Iguchi (Machine Girl), among others. That ought to give you some idea how of bizarre or extreme segments can get, and I'm not just talking about the rampant toilet humor. Any semblance of taste or adherence to boundaries are missing from this film. Sensitive folks, be aware that there's some strongly implied animal cruelty, some child abuse, and then there's "X" and "L", which I probably could have done without ever seeing. So just know that there's some rough stuff in The ABCs of Death in addition to the silly and the trivial. I'd recommend it, but know that it might be better to wait for the DVD to come out so you can skip over certain letters. Either way, it's an experience you won't likely forget for a while. Tune in tomorrow for more coverage of Nevermore, including a double feature of George A. Romero's Dawn of the Dead and Don Coscarelli's John Dies at the End. See you then! * No offense to Mr. Poole, who does a fine job in the film, but the similar features and sounding name are only going to complicate my ability to convince people that it is NOT, in fact, Jesse Pinkman in the movie. Labels: Anthologies, extreme violence, Film Festivals, Horror Films, Religion, Short Films, What the Hell was that?